Since launching QualityTime back in January this year, we have received an overwhelming amount of feedback and responses from many of you on how our app has helped you understand how much time you are glued to your smartphones. Many of you were shocked by your mobile behavior and took different methods to curb their mobile usages. 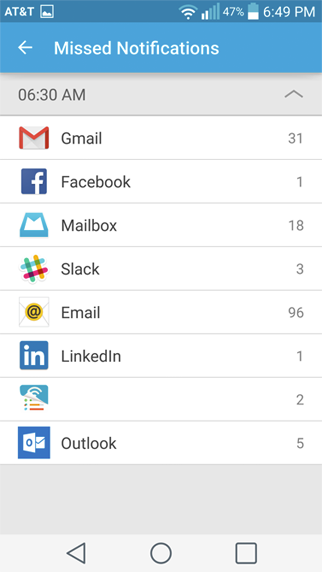 Once you know your mobile usage habits, what’s next? 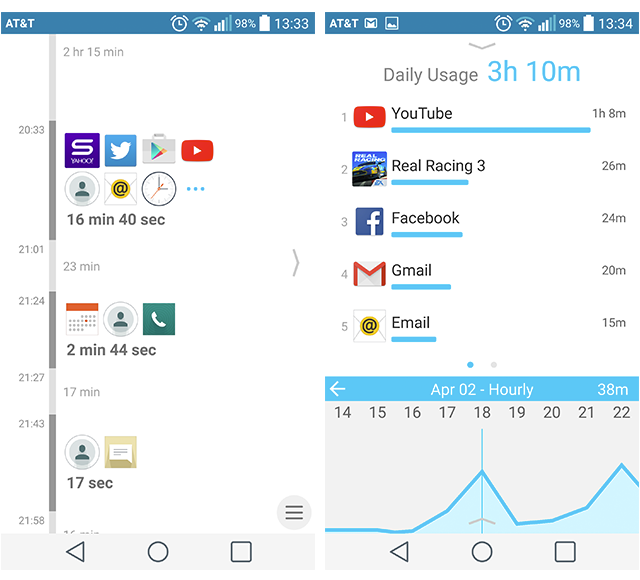 Many users told us that they were looking for ways to help them cut back their mobile usage addictions. They want to unplug from their devices to get some quality time but are afraid to do so because they may be missing out on important calls, messages or emails. 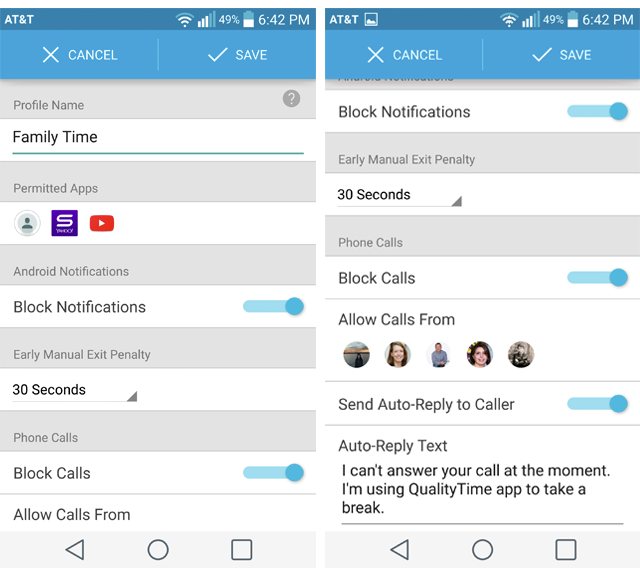 QualityTime 2.0 includes many new features that help address this exact need. Permit access to certain apps during those restricted periods. Select the penalty time (how long) you have to wait before you can use the phone if you cancel your “Take a Break” early. 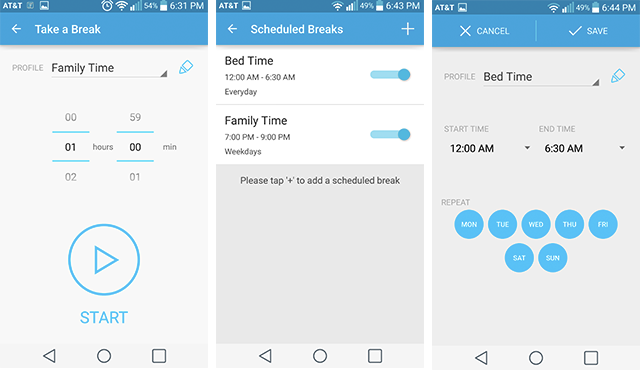 Once you create different QualityTime profiles, you can apply that profile to “Take a Break” or different “Scheduled Breaks” to tell our app how you wish to unplug to minimize unnecessary smartphone distractions. Once you create your QualityTime profiles you can use the “Take a Break” and “Scheduled Break” features. Often you may want to block out unnecessary distractions from your mobile device for a certain period of time so you can focus on your work, homework or get the sleep you need. You can use “Take a Break” to immediately unplug your smartphone for an extended period of time, or plan your “Scheduled Breaks” in advanced (e.g. family time, bed time, study time) with start/finish time on repeating schedules. You can choose different QualityTime profiles for “Take a Break” or “Scheduled Breaks” to tailor how you wish to unplug. 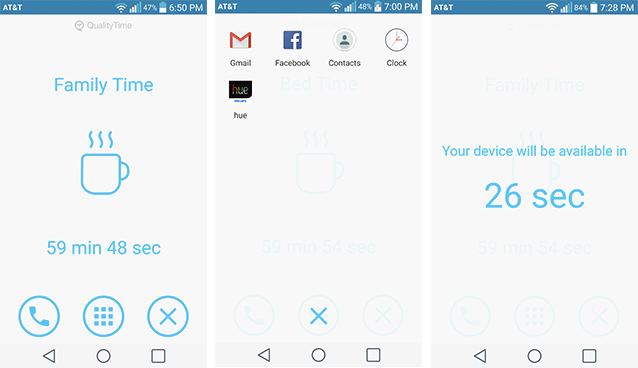 We even created a “Take a Break” Android widget to provide one-click access to “Take a Break”. During your “Take a Break” or when a “Scheduled Break” is underway, you will see the blocking screen which prevents you from accessing the device. 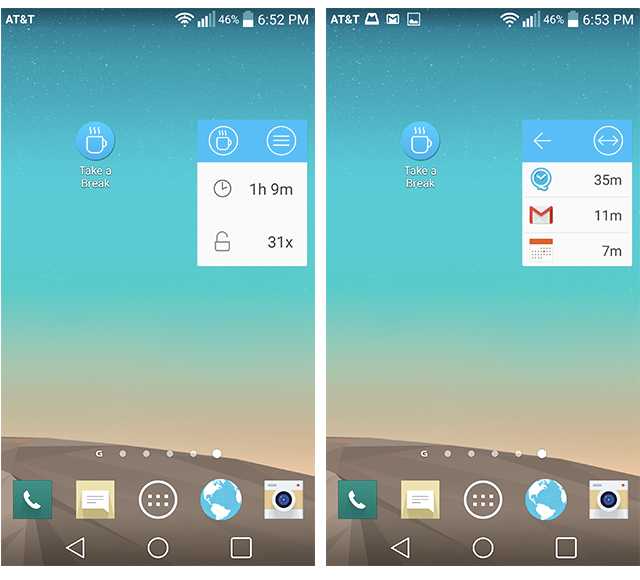 However, you can still make phone calls (phone icon) and access your important apps (middle tile icon). 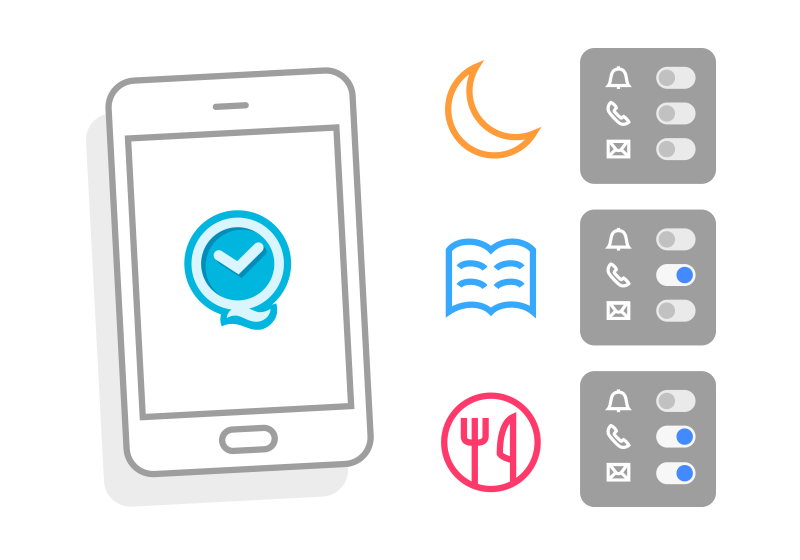 Depending on how you defined your QualityTime profile, you will still be able to receive calls from your ‘whitelisted’ phone contacts while blocking out all other callers with an auto-reply message feature. If you really want to exit the break early, you can terminate “Take a Break” or “Scheduled Break” with the X icon. However to discourage you from exiting your detox ahead of time you will need to wait for your specified early-exit penalty (e.g., 30 seconds) to elapse. if you enabled the “block notifications” feature in your QualityTime profile, our app will automatically capture all your blocked notifications during your “Take a Break” or “Scheduled Breaks”. That way you won’t miss anything important. You can always refer to this missed notification center to catch-up what is important to you after your detox. Get a quick glance of today’s usage status with the QualityTime dashboard widget. Now you don’t need to open the app to get an idea of what you’re using. 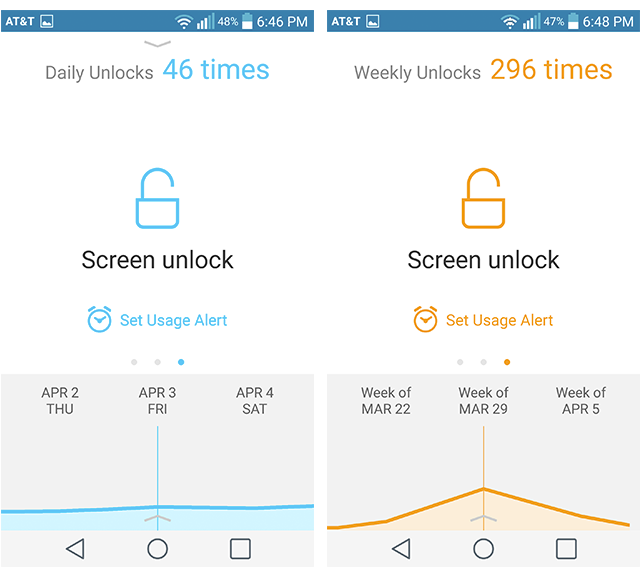 You can now find your daily and weekly screen unlock history. The history shows how many times you have unlocked the screen to access your phone, which is an indication on how addictive you are to your smartphone. If you need to cutback your smartphone access, set a ‘screen unlock’ usage alert (e.g. 50 times/day), and the app will prompt you when you exceed the limit. 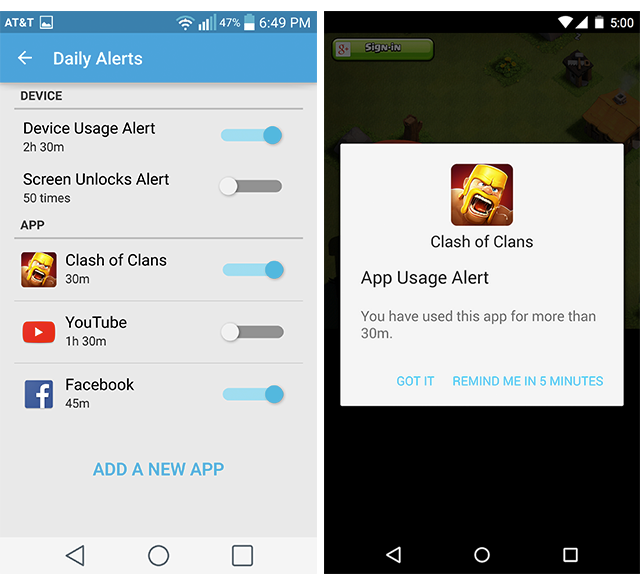 You can now define up to 5 different app usage alerts (from the previous limit of 3) to cut down addiction to specific apps (e.g. addictive social/gaming apps). The timeline now converts to 24-hour display format based on your local device time settings. We upgraded our UI/UX based on Google’s Material Design. If you have an Android Lollipop device (version 5.0 and above), you will see the enhanced Material Design details like responsive animations and transitions, depth effect such as lighting and shadows to provide a refreshing new visual look. French and Korean language support has been added. We now support six languages including English, French, German, Spanish, Portuguese and Korean. We want to thank our brilliant users who provided us with feedback to make our app even more awesome. We are always open to your thoughts and suggestions. Let us know how we are doing by sending an email to support@zerodesktop.com. Thank you for joining us in taking control of your digital diet! QualityTime is a trademark of ZeroDesktop Inc.